An exciting new prop for yoga class, the Fitness Balance Cushion can take your students' balance postures to a new level! Use our balance cushion in bear posture under one knee, or in crescent pose under the front or back foot to challenge stability. 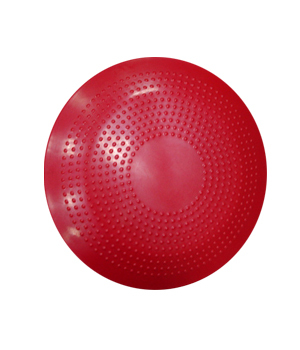 Made from a pliable PVC, this 14" disc-shaped cushion is smooth on one side, with textured nubs on the other. Use for ankle therapy, core strengthening, balancing, or stabilizing in specialized yoga classes like chair yoga. This lightweight and versatile prop is limited only to your imagination! Popular in many Chair Yoga classes, our Yoga Balance Cushion allows you to turn sitting on a normal chair into an abdominal exercise! Because the disk-shaped cushion is full of air, the Balance Cushion creates an unstable surface for you to sit on. Sitting on the cushion forces you to sit tall with good posture, eliminating any back and neck pains you may experience when slouching in a chair. And while you sit with perfect posture, you will be toning your abdominal muscles, without even realizing it! This product had deflated in storage - had to be inflated before use. Otherwise a great tool for PT or yoga exercises for balance. I bought these for my 7yr olds 2nd grade class. They are the perfect size to fit in their chairs and are easy to store since they aren't the big yoga balls. They are great for the wiggly kids, like my son, who can't seem to stay seated on their bottoms. So glad we found these!!!! Order arrived quickly. Already inflated. Score. I have not felt the need to add more air. And I loved the price/value of 2 for 1. Thank you. I was introduced to these by my chiropractor. I have L5/S1 bulging discs/sciatic challenges. Sitting has become my enemy. I now keep one at work and one at home. Makes sitting more engaging. I drive a lot so I was hoping I could use one in the car; Can't recommend it for that. I'll be searching for another support for the car. I am a yoga therapist and I use this cushion in so many ways. On a chair seat for chair yoga to add challenge. On a chair seat adding in lifting one leg and have the students use resistance bands for upper body work. Great tool for balance and ankle/knee stability. Suggested for clients with back pain or sciatica and many have found relief. Kids classes really enjoy them too. Only limited by your imagination. I am creating a class called ageless agility for over 55 and will be using these in my classes. Fast shipping too! This comes filled with air but not inflated enough.And you need a ccompletely different pump than the other yoga/pilates props used...you need a pump with a needle. Only cones inflated enough to use with some clients. And each ball is inflated differently.